Rentonwa.gov | 7 RENTAL SPACE Rental space for public and private use is available during operating hours. Meetings, parties, or gatherings of 100 or less are welcome. 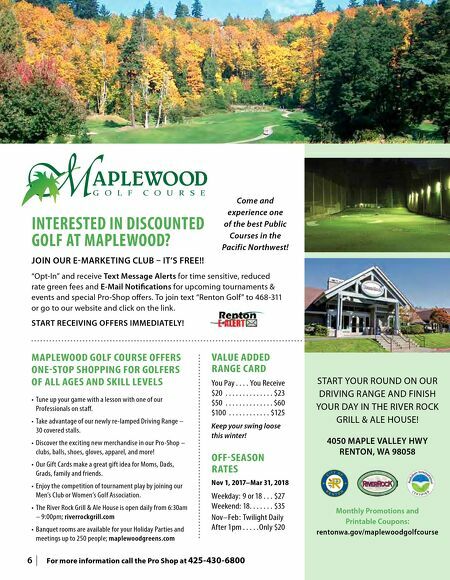 Call Tom Puthoff at 425-430-6766 to arrange a tour of the facility or for additional information. 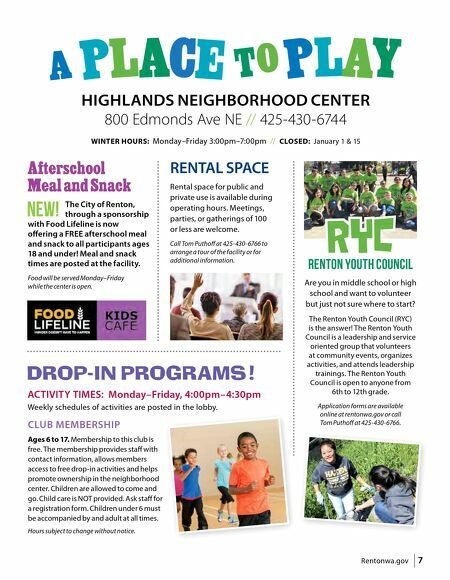 HIGHLANDS NEIGHBORHOOD CENTER 800 Edmonds Ave NE // 425-430-6744 WINTER HOURS: Monday–Friday 3:00pm–7:00pm // CLOSED: January 1 & 15 Afterschool Meal and Snack The City of Renton, through a sponsorship with Food Lifeline is now offering a FREE afterschool meal and snack to all participants ages 18 and under! Meal and snack times are posted at the facility. Food will be served Monday–Friday while the center is open. RYC Renton Youth Council Are you in middle school or high school and want to volunteer but just not sure where to start? The Renton Youth Council (RYC) is the answer! The Renton Youth Council is a leadership and service oriented group that volunteers at community events, organizes activities, and attends leadership trainings. The Renton Youth Council is open to anyone from 6th to 12th grade. Application forms are available online at rentonwa.gov or call Tom Puthoff at 425-430-6766. ACTIVITY TIMES: Monday–Friday, 4:00pm–4:30pm Weekly schedules of activities are posted in the lobby. CLUB MEMBERSHIP Ages 6 to 17. Membership to this club is free. The membership provides staff with contact information, allows members access to free drop-in activities and helps promote ownership in the neighborhood center. Children are allowed to come and go. Child care is NOT provided. Ask staff for a registration form. Children under 6 must be accompanied by and adult at all times. Hours subject to change without notice.